The blast may have wiped out one of America’s first Stone Age cultures as well as the continent’s big mammals such as the mammoth and the mastodon. The blast, from a comet or asteroid, caused a major bout of climatic cooling which may also have affected human cultures emerging in Europe and Asia. Scientists will outline their evidence this week at a meeting in Mexico. These sediments contain exotic materials: tiny spheres of glass and carbon, ultra-small specks of diamond – called nanodiamond – and amounts of the rare element iridium that are too high to have come from Earth. Clovis hunting points, Center for the Study of the First Americans The Clovis people developed an advanced stone tool technology The blast would not only have generated enormous amounts of heat that could have given rise to wildfires, but also brought about a period of climate cooling that lasted 1,000 years – an event known as the Younger Dryas. “All the elephants, including the mastodon and the mammoth, all the ground sloths, including the giant ground sloth – which, when standing on its hind legs, would have been as big as a mammoth,” he told the BBC. According to the traditional view, humans crossed from north-east Asia to America at the end of the last Ice Age, across a land bridge which – at the time – connected Siberia to Alaska. The Clovis culture was one of the earliest known cultures in the continent. These proficient hunter-gatherers developed a distinctive thin, fluted spear head known as the Clovis point, which is regarded as one of the most sophisticated stone tools ever developed. Archaeologists have found evidence from the Topper site in South Carolina, US, that Clovis populations here went through a population collapse. 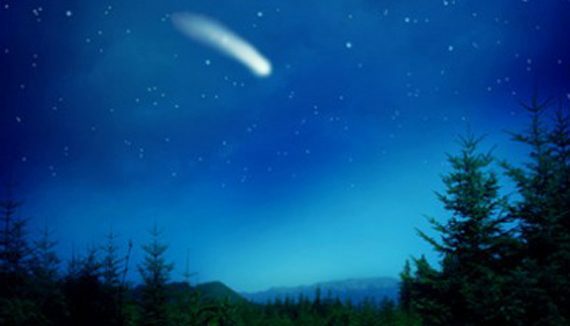 According to the new idea, the comet would have caused widespread melting of the North American ice sheet. The waters would have poured into the Atlantic, disrupting its currents. The new theory will be presented and debated at the American Geophysical Union’s Joint Meeting in Acapulco, Mexico, in late May 2007.